PFB-78. 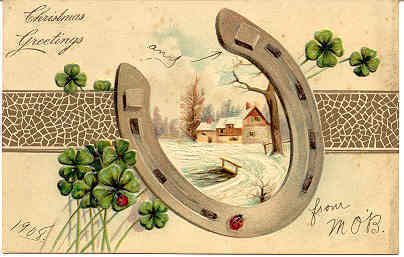 An Excellent Christmas card wishing you luck at Christmas. Published by Paul Finkenrath, Berlin, series 6150, card # 3 in the McAllister PFB Guide. Card has a DB-USD-writing on front, PM December 22, 1908 and in Excellent condition. Buyer pays 1.95 S H for U.S. delivery 1st Class Mail. FOREIGN and all other addresses pays 3.95 S H for Standard International Delivery. Discounted S H available for multiple card purchases. Insurance is the responsibility of the Buyer as all cards are very well packaged and I will not be responsibile for loss or damage once the card has been shipped. I accept Cashiers Check, Money Order, or Personal Check. NO CREDIT CARD PAYMENTS OF ANY SORT.